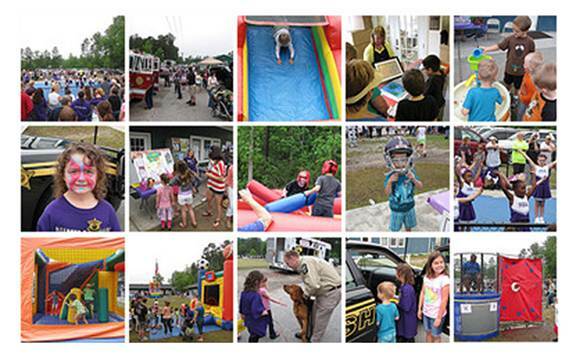 LELAND, NC: April 28, 2012 – The Roger Bacon Academy’s Charter Day School hosted their annual Spring Festival and Open House last Saturday, April 28th, 2012. The event attracted over 600 people from the community and had a multitude of games and performances for all ages. The school’s nationally ranked cheerleaders performed their award-winning routines, and the world ranked archery team demonstrated their skill on the school’s archery range. “Ask me” booths provided parents and students with the opportunity to ask K-8 teachers questions and look at classrooms. A book fair supporting the school’s library and an art show highlighting student art work also ran in conjunction with the festival. Dunking booths, inflatable games, clowns, fire trucks, police cars and rescue vehicles rounded off a fun-filled day. The Roger Bacon Academy – Charter Day School is a tuition-free, open enrollment K-8 public school in southeastern North Carolina. Since 2000, Charter Day School has focused on quality education and is a premier performance-driven year round school. Widely recognized as a compelling choice to conventional public education, the school has built a reputation for retaining dedicated and highly qualified teachers that give students a strong and proven academic foundation. Charter Day School has received numerous awards, including the designation of being a Top-25 School for Academic Growth and of Excellence in the state of North Carolina.